Project Works is a cloud based workforce management platform designed to help professional & creative services businesses better manage their organisations in the areas of project management, project financials, and people management. Our mission is to provide a platform that helps world class services businesses to get the most out of their existing workforces, and enable them to grow. Born out of a professional services business, every aspect of the Project Works platform has been carefully designed to support running projects in real world situations. If you are interested in a getting a demo of what Project Works has to offer, or you would like more information on the Project Works platform, please drop us a line on our contact page. Resource booking is at the heart of Project Works. By assigning resources to projects on an hours per week basis, the entire organisation has a single view of who is doing what, without having to get down into project details. You have the ability to resource users to Projects based on location and capability, and real time resourcing indicators enable you to see immediately if resources have availability or are over stretched. You can easily see what teams are being stretched, and what teams need more work to do, ensuring the pipeline of work is well managed. Shadow resources enable projects to be resourced and planned before named resources are available. Create schedules with Gantt charts in a familiar format. Drag & drop to move tasks, set duration, re-order, and create dependencies all from within the browser. Assign your resources to tasks, set available hours, and what rate cards to use. By tracking task status and completion percentages, project managers can easily determine overall project status and whether the burn rate is satisfactory. You can also verify schedules are achievable with our allocation profiling module that balances available resourcing with allocated task hours. Task management is easy with Project Works. By allocating project budgets out to individual tasks, and assigning available hours and setting rates you can keep an eye on your project financials as the project progresses. Rate cards give even more flexibility for situations such as discounts. By comparing this with timesheet data and task progress you can easily view if what has actually been worked lines up with your forecasts. Risk management is crucial when managing large projects, especially when there are multiple external dependencies with different owners. Project Works enables you to capture project risks and manage mitigation plans both within individual projects and across an entire customer. By storing details and proposed mitigation plans along with impact and proximity ratings, it is easy for anyone with access to see the most pressing project risks. Assigning risks to individuals ensures risk ownership, and tracking risk categories, likelihoods, and actions provides important information to all stakeholders involved. By tracking projects through the entire life cycle you can ensure any sales investment is turning into real business. Project Works tracks from Opportunity, to Committed, to Signed Work In Progress, to Support, and finally to Closed. The CRM functionality allows the managing of actions and contacts against individual clients, making it easy to track anything from client meetings to product renewals. 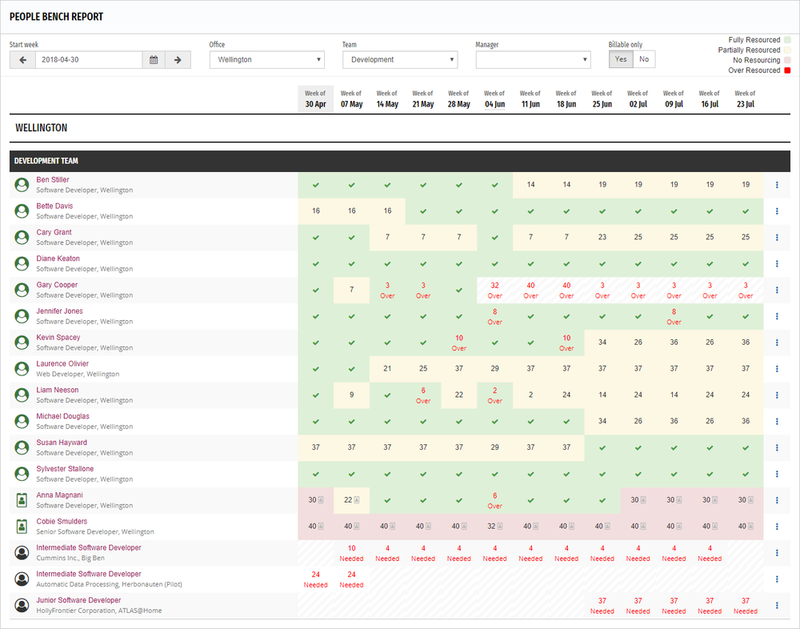 Managers can quickly see any resources that have upcoming availability, or resources that have been over booked. By using a combination of Work Week Profiles (setting the available work hours per day), and User Postings (setting what work week a user is associated with over time), capacity planning is flexible, accurate, and clear. By also differentiating between fixed employment and contractors, managers can ensure that staff on the payroll have work coming up, while still being able to scale up and down with contractors all from the same screen. Shadow resources can also be swapped out with named resources who have availability, making project planning hassle free. Invoicing is easy in Project Works. 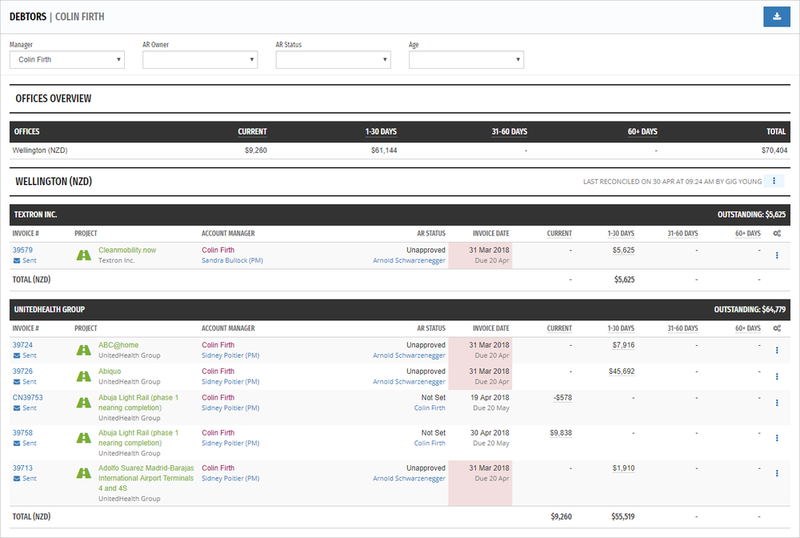 Invoices can be defaulted to included any unbilled time (time and materials billing), or to revenue forecasts (fixed price / value based billing). Which ever method you prefer, invoice amounts are cross checked with forecasts and validated against actual timesheet entries. Individual timesheet entries, or entire invoice lines can be manually overwritten making write-offs and effective earn obvious. Configurable approval workflow gives the flexibility for a single person to own the invoicing process, or having different people performing different steps from creation through to PDF generation. Debtor management is critical for the health of any services orientated business. By quickly identifying which customers owe money when, you can have confidence in your businesses current financial position. The debtor management module gives a quick overview for each office, highlighting outstanding invoices, and how overdue they are. The AR Status and AR Owner can also be set with timestamps and comments making outstanding debts and their required actions clear. There is then the ability to track full or part payments against invoices and reconcile with your accounting software. Ensuring you are recovering the time you spend on client work is critical to the survival of any professional services business. With our carefully designed Month End screen, project managers can easily see both billed an unbilled hours, along with how much was invoiced for the effort worked. Any write-offs or write-ons are also easily visible, and acceptable tolerances can be set by an admin for when recoverability falls outside the set threshold and requires comment from the project manager. 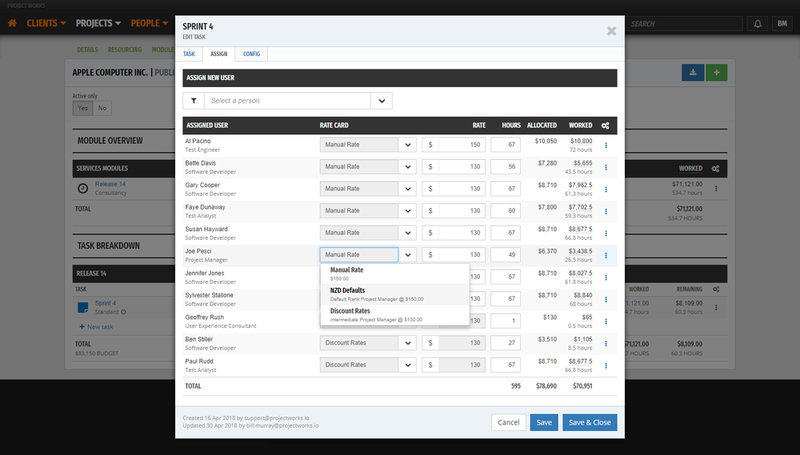 By creating revenue budgets for combinations of Offices, Currencies, and GL Codes for each month, you can compare these to revenue forecasts and actual invoices in real time. This gives managers much quicker visibility around how the business is tracking toward budgets as they don't need to wait for financial reports to be produced after the fact. Revenue Forecasting is done by Project and Account Managers for each month, independent of project budgets. Forecasts can then be compared with what is resourced going forward to determine how realistic they are. Forecasts can also be compared with actual invoices to determine their accuracy retrospectively. A detailed change log also enables users to track forecasts as they change overtime, so inaccurate forecasting can be managed in a clear and structured manner. This gives managers a clear picture of expected cash flow, and means discussions around any problems can happen sooner rather than later. Project Works allows the tracking of staff costs over time. This gives the ability to easily determine the margin being made off of an individual, a Team, an Office, a Project, or a Client. Being able to easily determine margin from these different perspectives is extremely important for a services business. From providing data to support salary reviews, through to determining if money being spent on sales is justified by gaining billable work, Project Works provides you with all the information you need. Tasks are created and allocated to people as time-codes. Managers have the ability to set tasks as "self-service", or they can tightly set the allocation of hours available for individuals, and the dates available for tracking. Tracked time can then easily be compared to project budgets, monthly forecasting, and actual invoiced amounts for a 360 degree view of a projects financial situation. Pinning and filtering codes, a long with a mobile friendly interface makes time entry simple for the end user. Tasks can also be assigned to different GL & Payroll Codes making integration with accounting and payroll systems simple. Building on the capacity planning features in Project Works, utilisation targets for billable work can also be set for individuals. Typically an organisation will have different levels of targeted utilisation across the business, such as 100% for contractors, right down to 0% for higher level management. Regardless of your businesses exact utilisation targets, the careful management of them is crucial. The utilisation module in Project Works shows you exactly where staff are spending their time, so you can ensure you are getting the best out of your workforce, and identify any areas that may need tuning. Project Works has an inbuilt leave booking system, with approval workflow. Types of leave and access to approval functions can be configured by administrators, along with leave specific custom fields which are useful for syncing leave balances with external payroll systems. Leave is also displayed on all resourcing screens. Statutory holidays can also be managed, and holiday calendars attached to both individuals and projects. By setting objectives for individual staff members and competencies for your entire organisation, a solid foundation is set for the formal review process. By having organisation wide objectives all staff are working on the same page, and by having clearly defined metrics and time-frames, staff are provided a structured development path. Both managers and employees can track progress against individual objectives, and make the results known to the other party when appropriate. Project Works provides the ability to track any certifications or exams a staff member has acquired, including expiry information and their contractual obligations. You can also keep record of what courses and conferences staff have attended and if they are contractually bonded. This information can be particularly useful when resourcing and a specific skill set is required, or when responding to customer requests around your organisations ability to provide specific services that may require accreditation. By tracking benefits associated with a staff member more detailed analysis can be carried out on the true cost of individuals. Benefit data can be factored in to gross margin reports, or compared to performance objectives and completed certifications. By having this important HR information all in one place, managers and HR staff can quickly get a complete view of an employee. Project Works includes a highly configurable Custom Fields engine which allows the attaching of Custom Fields to Clients, Projects, Users, Modules, and Tasks. Our Service Point security model enables the creation of User Roles tailored to specific users or tasks. On top of reporting options within the Project Works application itself, all plans come with a direct SQL Server connection that provides grouped and aggregated data available for analysis. We also have a range of options available for use with Microsoft Power BI, including providing a number of pre-built reports. Any software product of Project Works nature is part of an existing eco-system of software. Project Works aims to work within existing eco-systems through providing API access with all plans, and the ability to request new API endpoints to suit your specific business needs. Project Works has a comprehensive online Knowledge base with detailed information on how to perform tasks with the platform. All Project Works plans also come with email support with under 24 hours response times, and in most cases same business day. Almost every screen within Project Works is responsive and adaptive. This enables users to use the device of their choice, from mobile, through to tablet, through to the desktop when interacting with the Project Works platform.